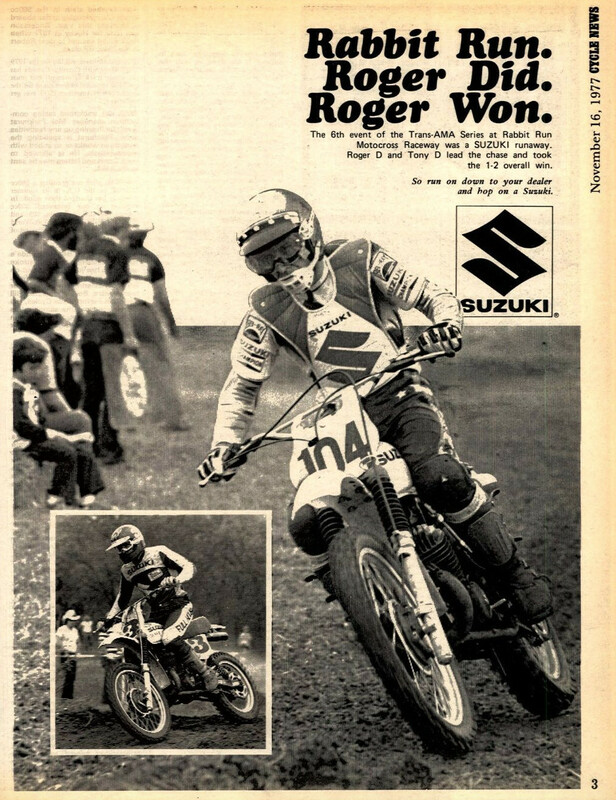 At Rabbit Run Raceway in Plano, Texas, just outside of Dallas, Roger DeCoster topped the Trans-AMA aboard his works RN400 Suzuki. It was The Man's fourth win of the '77 series to date. The five-time 500cc World Champion posted 1-4 finishes, as several of his main challengers had inconsistent days. Bob "Hurricane" Hannah picked up a flat tire in the first moto and won the second. Team Honda's Brad Lackey crashed in the first moto and went 9-2. Kent Howerton went 2-10 on his 390cc Husqvarna. And another Honda rider, Tommy Croft, went 3-10. As it worked out, second overall with 4-3 scores was DeCoster's Suzuki teammate Tony DiStefano, the three-time AMA 250cc Pro Motocross Champion. In the 250cc Support class it was AMA 125 National Champion Broc Glover leading the way on his Yamaha with 2-1 scores to better the 1-2 of Honda's Warren Reid. Rounding out the podium was Husqvarna's Chuck Sun with 3-4 scores. For the second year in a row Yamaha's David Vuillemin wins the King of Bercy laurels in front of an adoring and partisan crowd in the Palais Omnisport in the suburb of Paris, France. Le Cobra won all six main events in sweeping the entire weekend, using some of the supercross skills he had picked up in battling the likes of Jeremy McGrath, Kevin Windham, Ezra Lusk, and Ricky Carmichael on the U.S. circuit. Vuillemin led a French sweep as Sebastien Tortelli finished the weekend second overall, Mickael Pichon third. McGrath, the seven-time AMA Supercross Champion, was there and went 2-2 on the first of three nights of racing but then crashed out in the middle leg. Damon Huffman ended up fourth overall, top American in the event. A young Kawasaki rider from Australia, Chad Reed, finished sixth. The "Prince of Bercy" would go to Yamaha of Troy's Justin Buckelew.